Bishop Dr George Frederick and his wife Elsie have made an indelible mark on the Pentecostal landscape in St Vincent and the Grenadines (SVG). Last Sunday, well-wishers of the Christian couple gathered at Faith Temple, New Montrose, where an appreciation service for the duo was held. Throughout the three-hour long ceremony, words like âsteadfastâ, âunwaveringâ and âstalwartâ were used by the many speakers to describe the couple, who have been in the local Pentecostal arena for over 50 years. From poems, songs, dances and citations, to remarks from church members and Prime Minister Dr Ralph Gonsalves himself, it was obvious that this country has benefitted from the service of the Fredericks. ââ¦Someone who bridged the gap and showed you that you can enjoy yourself and serve God,â is how Dr Reynold Murray of the Revival Centre Ministries described Bishop Dr Frederick. Dr Murray said that over the years, he has watched Frederick involved in all aspects of Vincentian life and culture, from the âKill the Billâ march to being outspoken about âCable and Wirelessâ and many other national issues. Dr Murray likened Pastor Frederick to the Apostle Paul, stating, âhe has become all things to all men,â while describing him as âwhat a real Christian should be likeâ. âI am delighted to follow himâ¦he is a light to young Vincentian men and anyone who is looking for someone to emulate, I recommend to you George Frederick,â said Dr Murray. Gonsalves said that Frederick was instrumental in raising the numbers of persons attached to Christian denominations that believe in âfull immersion water baptismâ. The Prime Minister said that the numbers show that in 1967, over 75 per cent of the people were associated with churches which did not believe in full immersion water baptism. He said that the Anglican Church had, according to the census, over 50 per cent of the churchgoers, while the Methodists and Catholics had another 20 per cent, but the last census in 2012 showed that the Anglicans, Catholics and Methodists have 21 per cent of believers, while 71 per cent now believe in full immersion water baptism, âlike John the Baptist did to Christ in the Jordan Riverâ. ââ¦and thatâs amazing,â said Gonsalves, who noted that he spoke about the numbers in the context in which the Fredericks came to SVG. 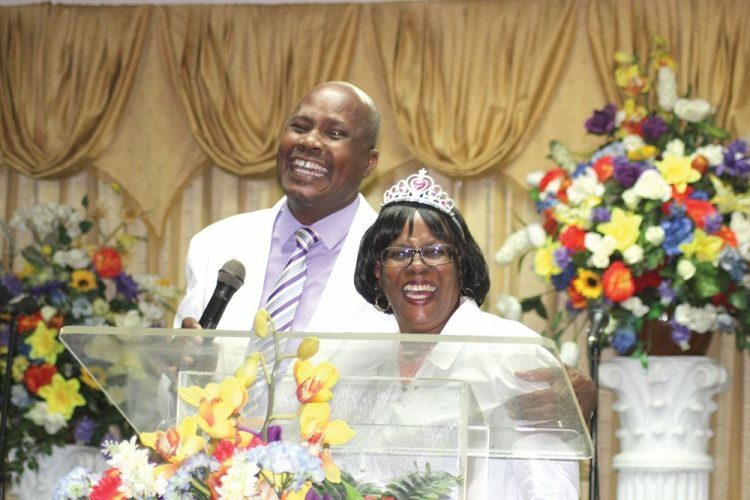 The Prime Minister said that the family is a humble one and Frederick and his wife display âgreat leadershipâ that moved the church, âHilltop Tabernacle,â from 12 members in 1987 to over 387 members in 2014, when Frederick retired from pastoring at the Golden Vale/Glen based church. âThey have made a phenomenal impact on peopleâs lives and that is why the census taker says the single largest group is the Pentecostalsâ¦,â said Gonsalves, who noted that he has listened to Frederick on numerous subjects and has read his books, while also stressing that the couple is not in the Ministry for money. Desire Armstrong and Beverly Haynes, while reading the citations, stated that Frederick is one of the co-founders of the television programme âEncounter,â which has been around for over 25 years. Elsie has given yeoman service to family and the assemblies where she worked, both in Grenada and SVG districts. Elsie was baptised in 1964 and started her ministry in 1965 at the MaryAnn Pentecostal Church in Grenada. She was a Sunday school teacher and enjoys, to this day, working with young people, in particular young women. She came to SVG in 1978 and attended the Faith Temple Church. In 1980, she assumed the office of District Womenâs Ministries Assistant Director and became Director in 1981, a position she retained for 24 years. Elsie moved to the Hilltop Tabernacle in 1987 to join her husband, who had taken up the pastoral mantle there. Haynes said that Dr Frederick started his Christian work as an evangelist on July 17, 1967 with a youth meeting at the MaryAnn Pentecostal Church in Grenada. Frederick worshipped at the Faith Temple from 1978 and in March 1987 moved to the Hilltop Tabernacle, where he meant to spend six months, but ended up staying for 27 years. Frederick has served on many committees, including being the District Treasurer for 17 years, the District Bishop from 1998 to 2001 and one of the longest serving members of the West Indies Board of Theology for 25 years and the Regional Director of the Menâs Ministries Department Pentecostal Assembly of the West Indies (PAWI). He has also spoken in many Caribbean islands. ââ¦Plenty persons became better persons because of the Fredericks,â said Haynes. The gathering also heard from Presiding Bishop of PAWI SVG Sonny Williams, Assistant District Presiding Bishop, PAWI SVG Stephen Ollivierre and heard poems from Michael Peters and Collin John. There was a dance by Samantha Diamond and songs by several persons. Bishop Williams described the Fredericks as the âquintessence of extraordinary generosityâ and noted that their coming changed PAWI SVG and the Christian community of SVG.